Evgeniya Chaburkina is a Russian legal consultant. 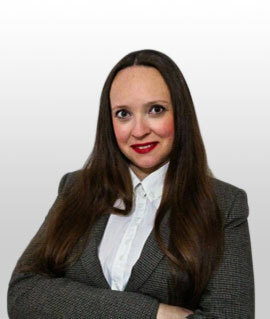 She has trial experience in Real Estate, Personal Injury and Corporate and Commercial Law. She advises Russian-speaking businesses from Russia, Ukraine, Belarus, Azerbaijan and other countries facing business challenges in Italy. She, as well as advising clients on any and all transactions, can prepare legal documentation in Russian, translate documents from Russian to Italian or English and vice versa. We understand the growing business opportunities in Russia. That’s why we have a dedicated, dynamic and growing Russian Desk at our firm. The Russian team is made up of native Russian speakers and specializes in dealing with legal matters in Italy. Private clients from Russia are mostly interested in investing in real estate and in acquiring assets in Italy, getting residency and work permits. We advice Russian companies that want to set up a business in Italy. Clients benefit from using the Russian Desk at Boccadutri because we offer services in native Russian. This saves our clients the time and money needed to translate correspondences, contracts and other documents, and virtually eliminates the risk of there being any misunderstandings. Team members include native Russian lawyers and all have a profound local knowledge and experience across legal, regulatory and cultural aspects. The members of the desk travel to Russia to meet our clients and other contacts in the region. Evgeniya Chaburkina graduated from the University of Samara (Russia). She speaks Russian, Italian and English.